Vanquish Fat For Good – Vanquish Fat Fast! 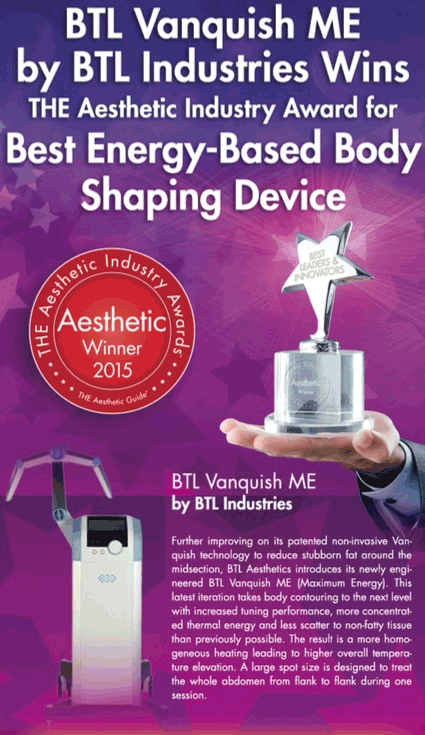 Non-Surgical & Painless – Meet The Most Effective RF Fat Removal Device Available – The New Vanquish ME. With Vanquish ME treatments you can safely remove fat cells from your abdomen, flanks, back, arms and legs without Downtime or Surgery. Vanquish ME is NEW & available ONLY at New Radiance St. Lucie Florida. New Vanquish ME Flex Applicator – Finally a technology to Reduce Fat around the Thighs and Saddle Bags and get rid of lose hanging fat under the Arms! the thighs and arms. The Flex applicator was made specially for use on the thighs and arms. It uses the same radio-frequency technology as Vanquish to non-surgically target and destroy fat cells in these areas. While Vanquish has had proven success in reducing the circumference of the abdomen, Flex has had the same success for the thighs. It can treat both the outer and inner thighs for a full circumferential reduction and contour. The Flex applicator is designed to smooth, tighten, and contour the entire thigh, resulting in shapely and youthful legs. It is especially effective on so-called saddlebags, the fatty deposits on the outer thighs which affect many women. What makes the technology so remarkable is its ability to treat your whole abdominal area – from flank to flank – rather than isolated spots like other devices on the market. In this way, you achieve a more intense, more effective treatment session, every time. The Vanquish Fat Melting Treatment uses Radio Frequency energy to target your fat cells and destroy them* without surgery or downtime. When you visit our Radiance of St. Lucie Cosmetic Center you will meet one-on-one with an expert practitioner who will personally introduce you to the Vanquish and help you plan a treatment to meet your body sculpting goals. Read below for more information on how Vanquish melts your fat cells. Vanquish ‘s radio-frequency (RF) energy is specifically tuned to target fat cells. 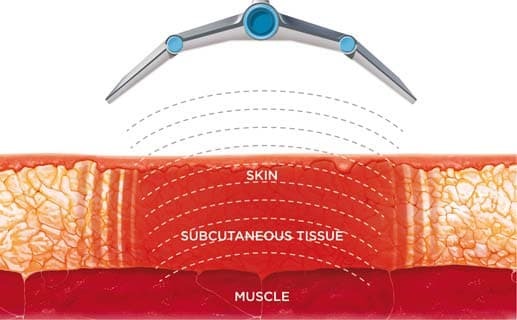 Due to the fact that electrical impedance of various tissue layers change BTL Vanquish ME is able to match and target thermal energy into the impedance range of your fat tissue, targeting only your fat, and not your skin and underlying organs. The Result? The procedure is able to trigger heat induced apoptosis – a deliberate elimination of your fat cells, and a reduction in fat around the treated area. The Vanquish ME treatment system is able to produce results, fast. Depending on the condition treated, the typical number of treatments required is between 2 to 6 sessions, scheduled 7 to 14 days apart. In many cases, patients have reported visible results as soon as a few days after treatment using Vanquish ME. The revolutionary part of the process is that the energy only targets your fat allowing it to safely eliminate fat cells without surgery or the pain associated with treatments like CoolSculpting! 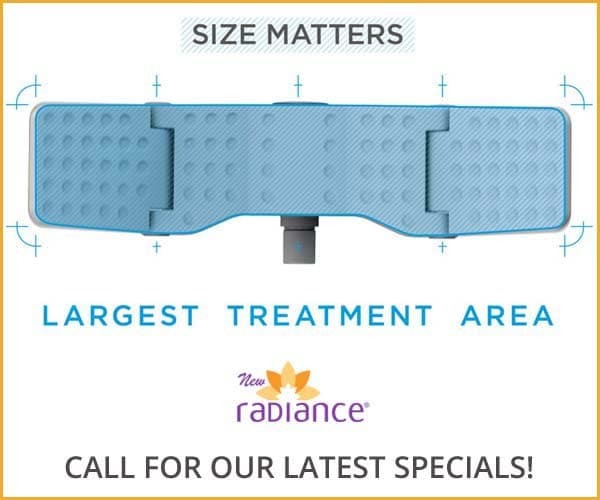 and now these same fat melting treatments* are available to you at New Radiance of Port St. Lucie. Will I feel pain during my Vanquish treatments? When can I go back to the gym after my treatment? It can take anywhere from 30 minutes to a maximum of an hour to perform the entire treatment session. The duration is depends on your individual fat loss goals and your Vanquish provider will work with you to setup the optimal treatment plan to sculpt your body. I'm fit & exercise regularly. I've done 1/2 marathons/triathlons & do Pilates AND I eat really healthy. But still I didn’t have the stomach I wanted. Procedure is painless. In fact I took naps through each. After 3 treatments, I have the tummy I deserve. Now my pants feel amazing & I’m bikini ready! It's worth it! I could not shrink my love handles no hard I worked out, so I wanted to slightly change my waist shape. I have 5 treatments and it worked beautifully. It's not a drastic difference, but I knew it wouldn't be for me (however a girl there shared hers and they were very drastic!). I am happy to have the jeans fit better, and just have an overall nicer shape in swim and dresses. He said I may continue to see a little shrinkage the next six weeks. I did not work out at all, as I was working too hard, so the credit is all due to this machine. If it's too close to your body, it does get hot, but they readjust and have a fan as needed. I had no side effects at all. I was going on vacation during the summer and didn't start working out in time LOL. I was headed to a beach destination and I had seen the Vanquish poster in Dr. Patel's office during one of my laser sessions and decided to give it a try. You go to each session once a week. The sessions were painless. It only leaves your skin with little redness for about 20 minutes after (and I have pretty sensitive skin). End result: It made me look way better in my bathing suit. The New Vanquish ME Melts your fat without Surgery or Downtime.